Turbine has released eleven new screenshots from the Dungeons and Dragons Online Halloween event, Mabar’s Endless Night. 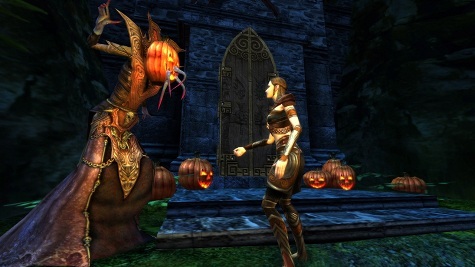 You can check out all the ghosts and ghouls in our Dungeons & Dragons Online screenshot gallery. An increase of Mabar magic has seeped through the depths of Delera’s Graveyard. Mix the enhanced magic with the Mabar Plane and the result is GIANT! The undead are now bigger than ever! Put them to rest (again) and you earn the chance to receive coveted ritual items such as a Chipped Skull, Burn-out-Black Opal and more. Turn in ritual items for ghastly prizes from the Night-Trader, as you move one step closer to unlocking the second half of this ghoulish event â€“ The Summoning Chamber!